I just had a lovely weekend away to relax and re-energize for the upcoming week. 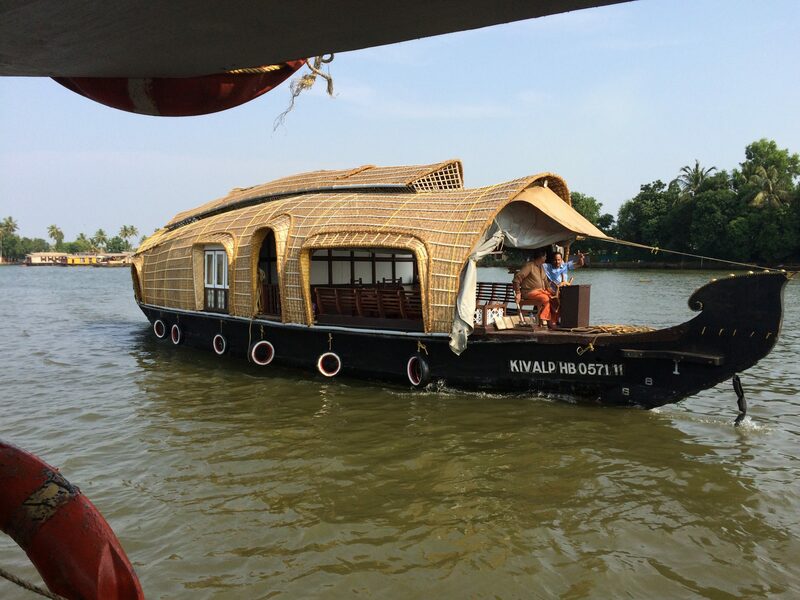 I went to Alleppey, which is on the coast in the state of Kerela and is known to be touristy as they offer unique houseboat tours. We drove up there Friday after placement and just returned tonight (Sunday). 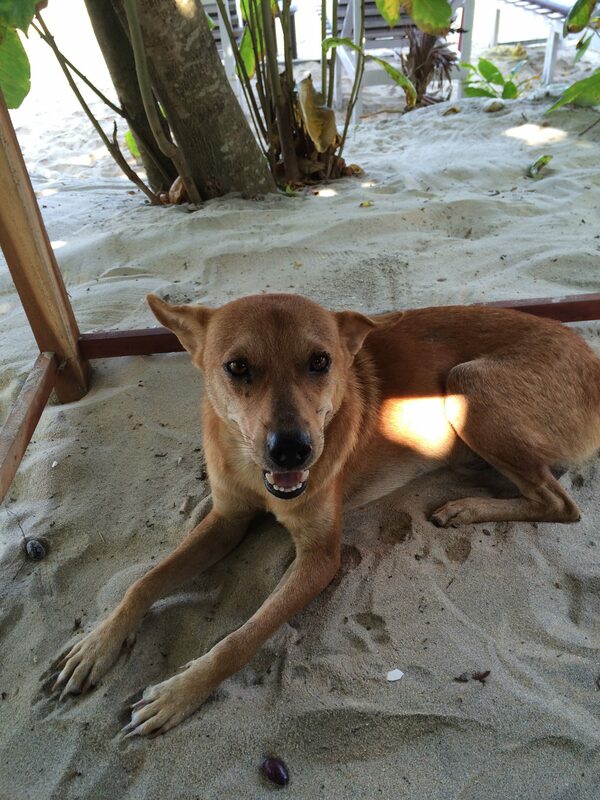 We spent Friday night at a hostel that was right on the beach. I was shocked when the advertised “beach view” room did in fact have a beach view! By the time we arrived it was already dark, so our only priority for the evening was to get some dinner. We walked down towards the larger beach area where there would be more restaurants and witnessed the India beach scene at night. It was hilarious. The beach was absolutely packed – I mean like hundreds of people on the beach running around, sitting in the sand, playing volleyball – doing all the beachy things you would expect. Only it was 8pm and pitch black. We spent some time just watching all the activity around us because we found it so strange and entertaining how busy the beach was. For dinner we couldn’t resist getting an order of “veg. smilee” (spelt as it was advertised), which turned out to be just what we expected – smiley fries! Saturday morning we lucked out by having some time to hang out on the beach before going for the overnight house boat tour. Just as we anticipated after seeing what we did the night before, the main beach area was dead. And I mean dead, like not even a single group of people sitting on the beach apart from a few people who were right down at the water taking a some pictures. No wonder people look at us like we are crazy when we are trying to soak up the sun. 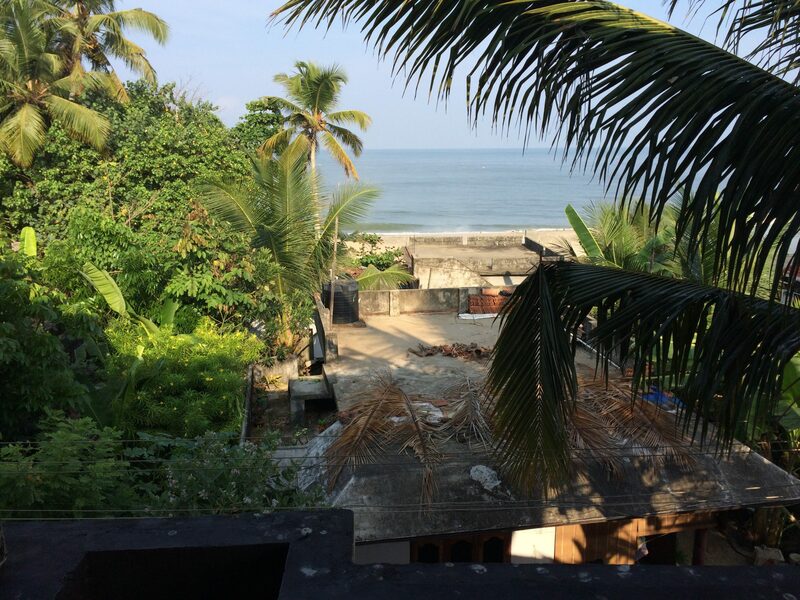 Similar to our trip to Varkala Beach, we didn’t really do any research prior to arriving and booking the weekend getaway, so each experience was a surprise. 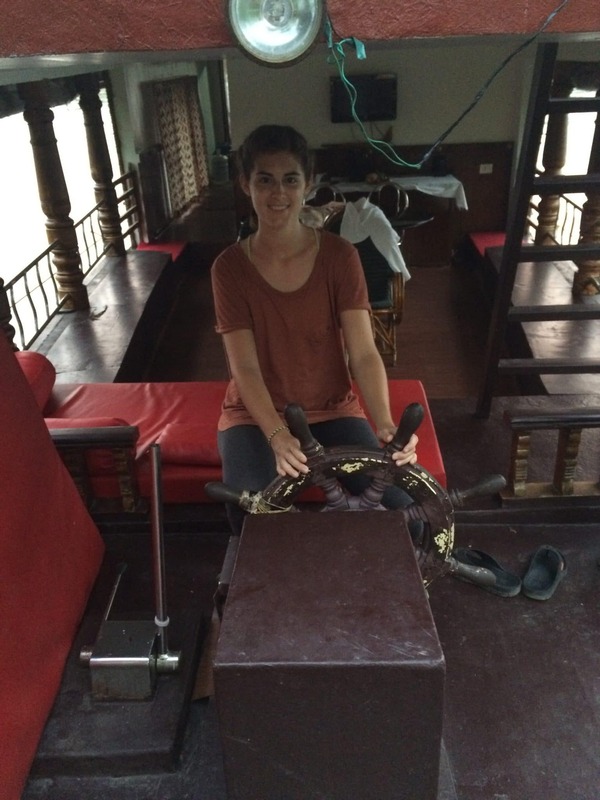 Getting on to the house boat itself was an experience. We didn’t really even know what the boats would look like, and definitely did not have any idea as to how popular the attraction really was. We had to climb through two other boats to get onto our boat. Having not realized this, we thought we were walking onto a boat full of older men and had a brief moment of panic wondering what we had got ourselves into. 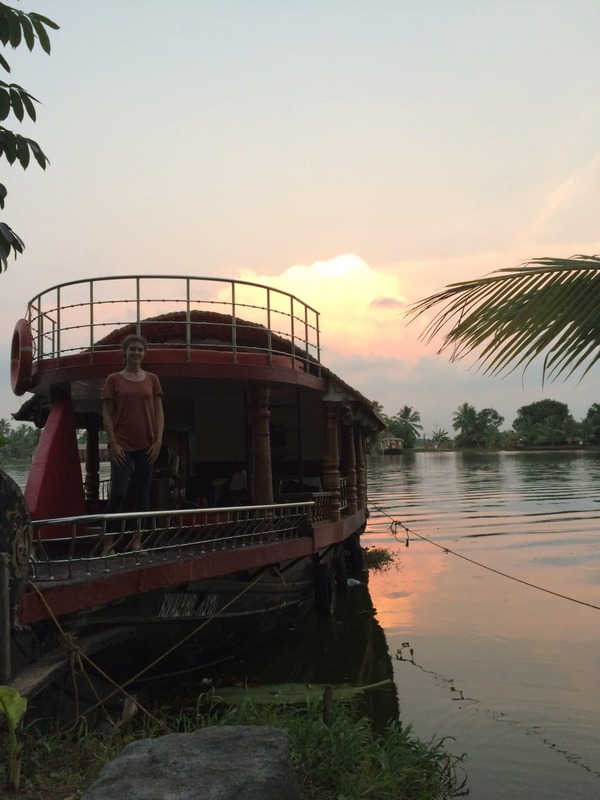 Thankfully, we continued through to our own private house boat! It was so cute with a comfy sitting and dining area up front, and our bedroom near the back of the boat. There was even a little sitting area at the top of the front of the boat that was perfect for getting some sun and an optimal view for taking in the surroundings. 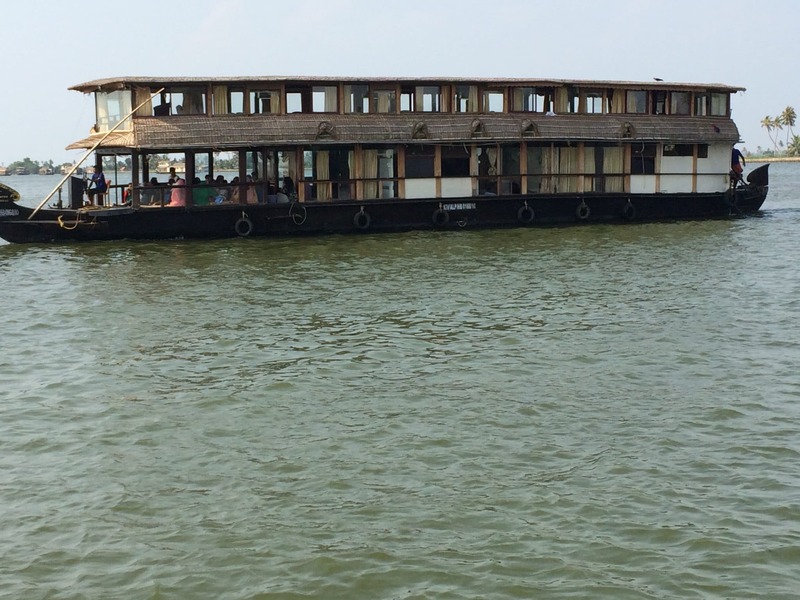 The houseboat experience is difficult to describe, but I will do my best, and include some pictures. When we started out there had to be over a hundred boats all heading out in the same direction. 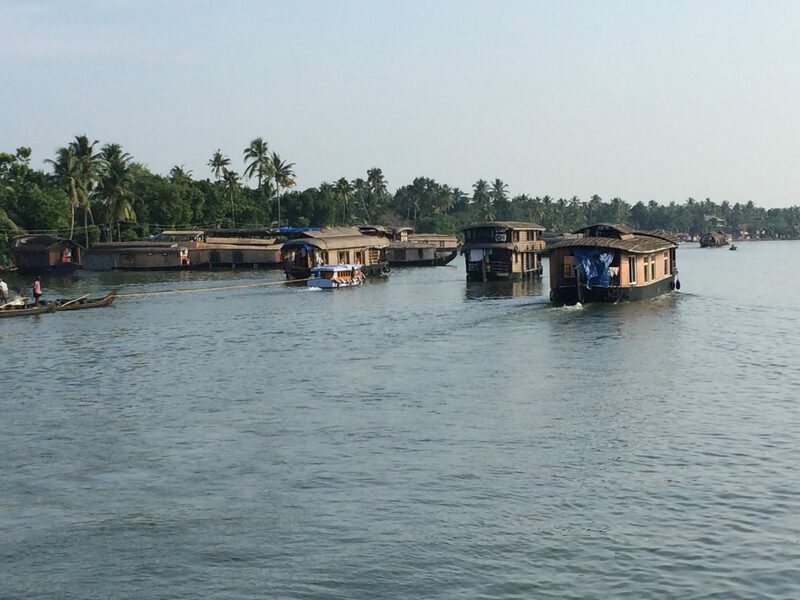 They call the area we boated around as the “backwaters”, which is basically a series of waterways near the coast of the Arabian sea that zigzag around. Most areas we boated in were filled with lots of other boats, going in all directions (seemed as chaotic as the road driving!). As usual, we were quite the attraction amongst the other Indian tourists and received lots of waves and “hellos” from all the passing boats, so at times we just sat at the top of our boat and waves at other boats as we passed. There were houses along the edge of most areas we passed, some with businesses offering snacks, massages, hotels, restaurants, etc., and others appeared to be houses with a mixture of more run down looking houses and some very nice ones that we wondered if they were vacation type homes. The sound in the video above is blaring from speakers on the shore to the left, they love their loud speakers. We had lunch, dinner, and the next days breakfast on the boat all prepared by a fantastic chef. The food was actually amazing, just as good as we have had anywhere else. The only other crew on our boat was the driver, who steered the boat from the wheel right at the front of the boat. We spent most of our day just sitting and either reading or making bracelets (thank you to Ashleigh for bringing us some string!). In the evening the boat docked at what looked like someones house. It looks like a source of income for people to offer up their property to dock and then use power from their house as well. 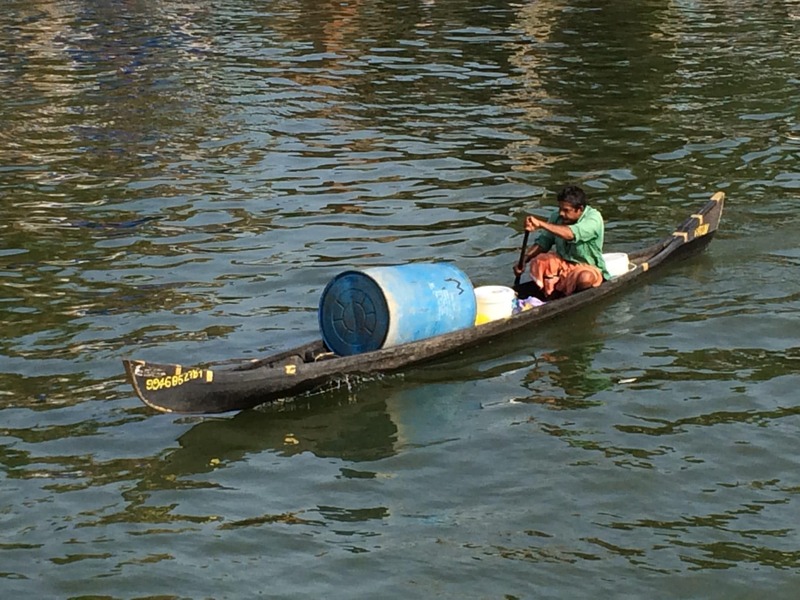 It was nice because we were able to get off the boat and wander around the village in behind the houses. We didn’t get too far, but it was great to walk around. Unfortunately at night we didn’t end up having any power because around 9pm we got a wicked thunderstorm. It sounded like some cracks of thunder/lightning hit very close to our boat, but we were safely enjoying the storm from inside our room. We found out from our driver the next morning that it was the first rain/storm they had received in 4 months, so I think everyone was happy for the rain. The storm didn’t last too long, but with the questionable power situation we ended up not having any power (meaning no A/C) for the whole night. The sleep was a bit rough, but waking up in the morning to the beautiful calm water made it worth it! 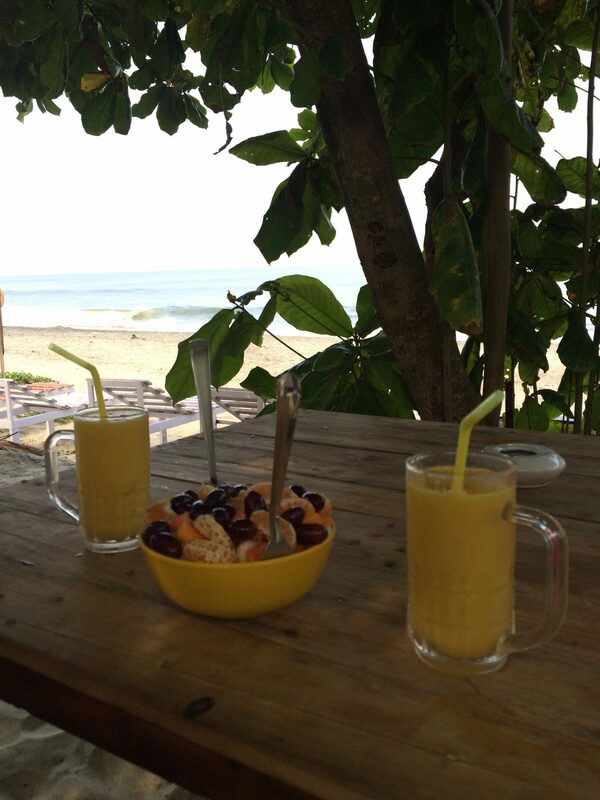 In the morning we had a delicious breakfast and then boated back to our pick up point. Things were surprisingly quite lively on the river even early in the morning, so it was again an entertaining ride back! Since the tour ended in the morning we took advantage of being by the coast to spend another few hours at the beach. 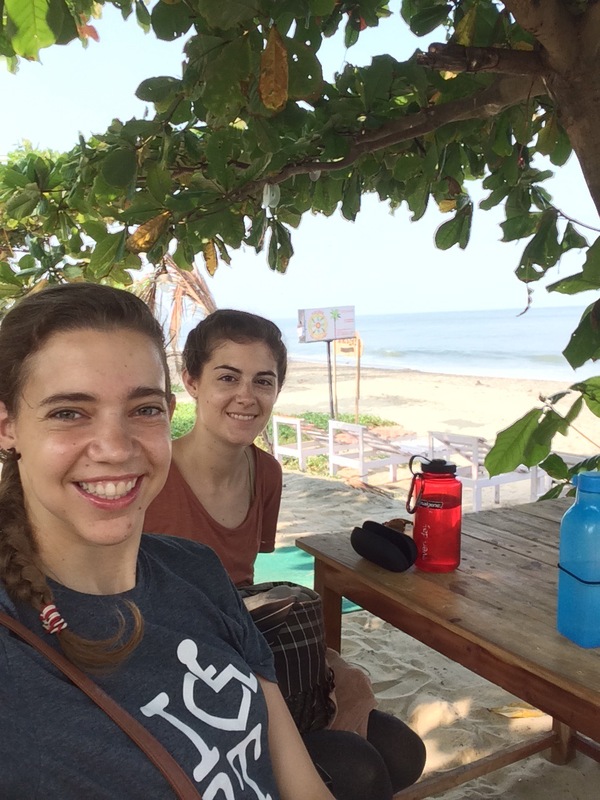 We were worn out from the sun, but a number of hotels had cute little beach side restaurants and lounge chairs that were in the shade, so of course, that’s where we chose to spend our time! And now here we are, back at ASSA. It is so nice because now when we return here it feels like home. It is such a nice feeling pulling up to campus. Over this weekend I had a number of moments where I just felt so incredibly thankful for being where I am. I think having some slower days and time to relax gave me the opportunity to reflect. The act of reflecting is a bit of an ongoing joke in our OT program because of how much we had to do it throughout our two years. It was to the point where we all felt “reflected out” by the end. But, I guess for me it isn’t such a bad thing because I actually enjoy reflecting on things that have happened. I find that when I reflect, I am able to see or realize things that I might have not initially thought about or noticed. It often gives me the opportunity to take a step back and look at the bigger picture. So overall, after this weekend I am feeling very appreciative for being on placement at ASSA and meeting all these amazing people, and also for being able to go away on weekends and explore other parts of southern India that add to my experience. 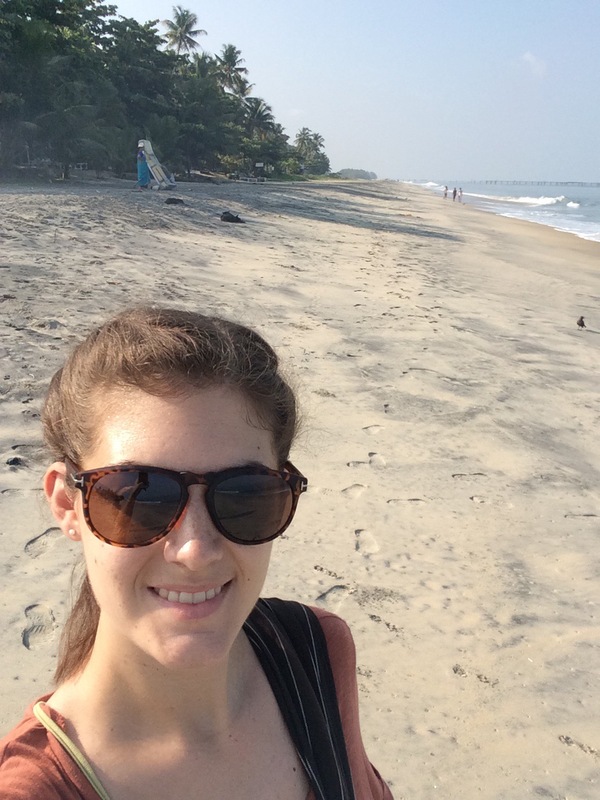 So glad you are finding time or taking time to explore and enjoy more of southern India. Like any change in routine, your weekend get-a-ways are making you appreciate your placement at ASSA – more. So glad to hear it is feeling like home. I think you are looking quite well in your pictures – a little more rested. I love all your pictures and videos. Thanks so much for sharing. You do such a good job. Thanks Gram, you’re right – time away definitely makes me appreciate things at ASSA even more! I will keep taking videos as it seems to give a better sense of how things are around here. Thanks for taking the time to read my blogs, it’s nice knowing you are following along!